Nothing says, "I love you," better than a Valentine you took the time to craft with your own two hands. So this <a href="http://www.inhabitots.com/6-eco-friendly-valentines-day-crafts-for-kids/">Valentine's Day</a> forgo buying cards and go DIY instead. Whether you want to make a sweet and fun <a href="http://www.inhabitots.com/how-to-make-recycled-bottle-cap-valentine-magnets/">Valentine</a> to present to your kiddo, create a sentimental card for your sweetheart, or help your little one design a card to give to a friend or family member, we've found some extra special ideas to spark your imagination. Read on to learn how to make six adorable <a href="http://www.inhabitots.com/how-to-make-easy-diy-kids-valentines-with-stuff-from-around-your-house/">DIY Valentine's Day</a> cards from paint chip bookmarks to thumbprint hearts. <h2>Valentine Fortune Tellers</h2> Thanks to <a href="http://www.designmom.com/2012/02/diy-valentine-fortune-tellers/">Design Mom</a>, making these clever Valentine's Day cootie catchers is easy-peasy. Start by printing the free <a href="http://www.designmom.com/wp-content/uploads/2012/02/fortune-teller-valentine-1.pdf">PDF pattern</a> (on recycled paper please!). 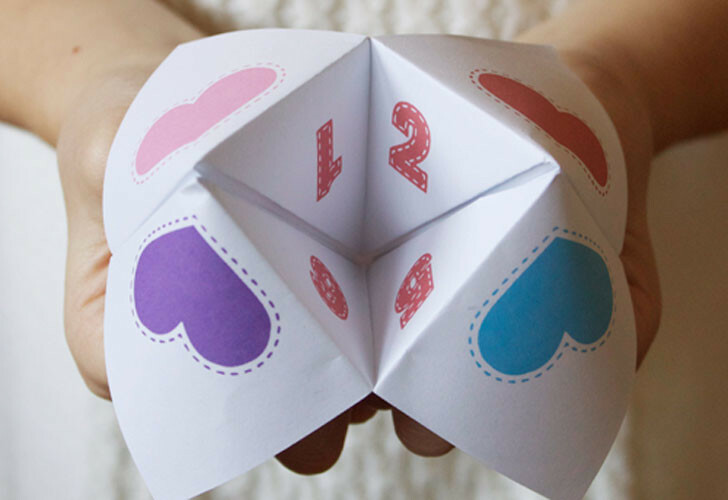 Then follow the folding instructions found <a href="http://www.designmom.com/2012/02/diy-valentine-fortune-tellers/">here</a> to turn the sheet of paper into a super-fun fortune teller. Give this to your child on Valentine's Day before school and you can bet she'll play it with her friends all day long. And no fortune is a bad fortune here - choices include, "You Rock," "Be Mine Valentine," "U R GR8," and "XOXO. <h2>Crayon Heart Valentines</h2> How thrilled would your little one be to receive a <a href="http://www.inhabitots.com/we-heart-etsy-7-green-valentines-day-gifts-for-kids/heart-crayons/?extend=1">heart-shaped crayon</a> for Valentine's Day? Try <a href="http://whipperberry.com/2012/01/crayon-heart-valentines-with-lifestyle-crafts.html">WhipperBerry's how to instructions</a> for making Valentines featuring homemade heart-shaped crayons. To make the crayons you'll need a silicone heart-shaped baking mold and lots of crayon pieces. Ideally, you'll recycle broken crayons and bits that are too small to color with any longer, but you could use new crayons if you don't have any headed for the trash. Fill the molds with crayon pieces and bake at 300 degrees for 15 minutes. 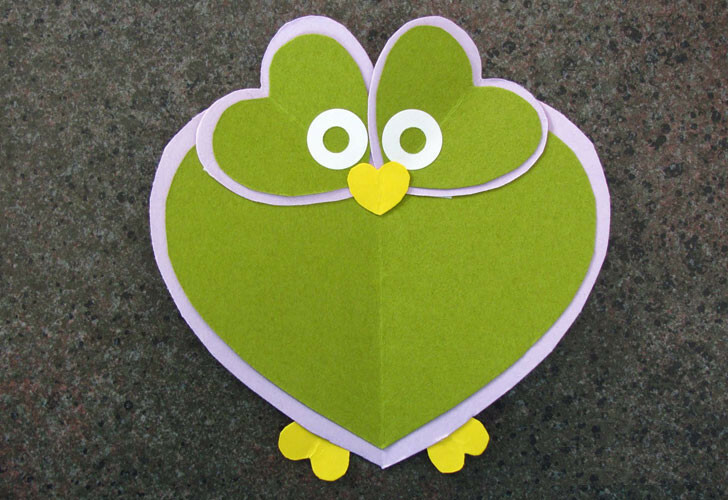 Next, cut heart shapes (sized slightly bigger than your crayons) out of recycled card stock or scrap paper you have lying around. Write clever sayings on the hearts such as, "You color my world!" Then, attach the hearts to the cards with a bit of double-sided tape. Find the full, detailed instructions <a href="http://whipperberry.com/2012/01/crayon-heart-valentines-with-lifestyle-crafts.html">here</a>. If you're feeling generous, you could make a whole tray of heart-shaped crayons and create enough of these DIY Valentines for your kid to pass out to classmates. 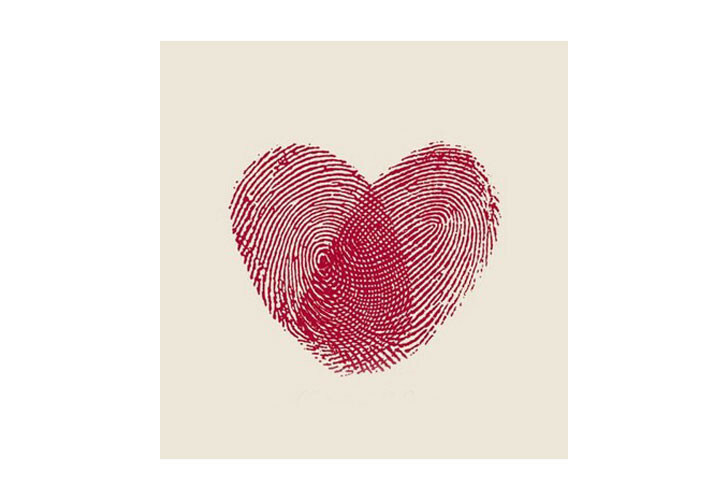 <h2>Thumbprint Valentine</h2> This DIY <a href="http://www.topit.me/item/1807735">thumbprint Valentine</a> couldn't be easier to make with your little ones and it's the perfect option if you need to make enough for an entire class of kids. Cut a sheet of recycled cardstock or paper into squares - you could easily make eight or 12 of these out of one sheet of paper. Then have your child make two criss crossing thumbprints in the shape of a heart on each one. Use either an ink pad or a <a href="http://www.inhabitots.com/new-pkolino-non-toxic-art-supplies/">non-toxic marker</a> to color your child's thumb for making prints. 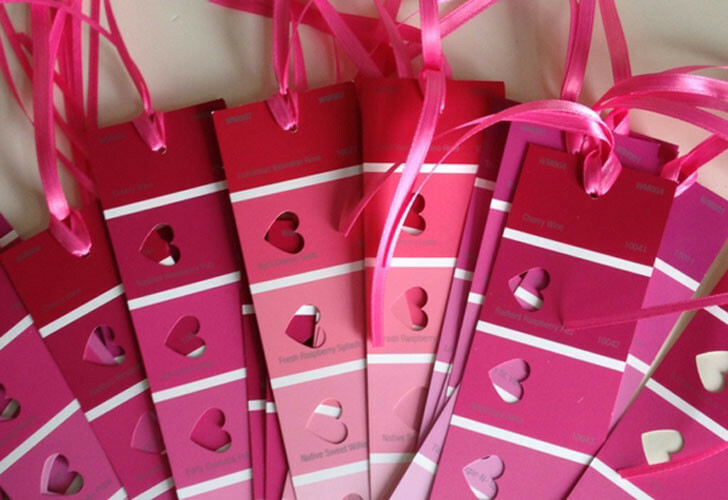 <h2>Paint Chip Valentine Bookmarks</h2> If you have some extra paint chips from your last home renovation (or maybe your friends or neighbors do?) 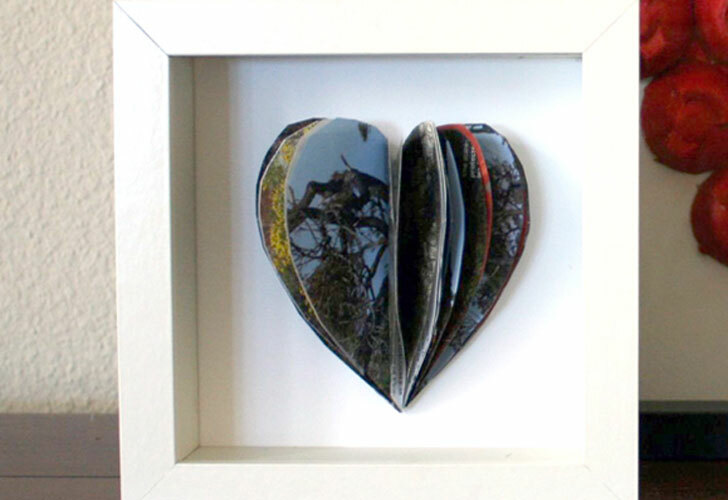 you can turn them into cute <a href="http://pinterest.com/pin/77264949826791460/">Valentine-themed keepsakes</a> in seconds. All you need is a <a href="http://marthastewartcrafts.eksuccessbrands.com/product/Punch+All+Over+The+Page++Studded+Heart.aspx">heart-shaped hole punch</a> and some ribbon to create these Valentines that will be treasured as bookmarks long after February 14. Simply punch a heart out of each color on the paint chip and complete one more punch at the top so you can add a ribbon. If your kids are helping, put them in charge of punching. Then, finish the bookmarks off by tying a piece of ribbon to the top. While these look especially festive for Valentine's Day in pink, red and purple hues, any color will work. <h2>3D Heart</h2> This 3D heart recycling project from <a href="http://alittlehut.blogspot.com/2010/02/recycling-project-no-20-3d-heart.html">A Little Hut</a> is sophisticated enough for your sweetheart. For this card, you'll use old magazines and catalogs. Start by cutting out one heart that is about 3 inches tall to use as a template. Next cut out 12 additional hearts from any magazine pages that you choose. Think about color and composition as you decide where to cut the hearts out. Maybe you have magazines with pictures of places you and your love have travelled together, or perhaps you can find images of different objects that are significant to the two of you in some way. Next, fold each heart in half the long way and add glue to 1/4 of the folded border. Stack another folded heart on that one and continue stacking and gluing the hearts until you're done. After the hearts dry, glue the whole thing to a piece of recycled card stock. For the full, detailed instructions visit <a href="http://alittlehut.blogspot.com/2010/02/recycling-project-no-20-3d-heart.html">A Little Hut here</a>. <h2>Owl Valentine's Day Card</h2> This adorable little owl dreamed up by <a href="http://livelearnlove226.blogspot.com/2010/02/owl-valentines-day-card.html">Live, Learn, Love</a> is made entirely from paper hearts. This is a cute Valentine to give or to create with your child. You'll need three colors of paper for this project, you don't have to use green, purple and yellow as shown above. First cut out one big heart from the green paper. Then trace a heart that's slightly bigger in size on the purple paper and cut it out. Next do the same for the two smaller hearts. Glue the green hearts on top of the purple hearts, making sure to center them. Then cut three little hearts from the yellow paper for the feet and nose, and glue them on where appropriate. The eyes shown above were created using paper enforcers, but you could draw them on as well. Find the full, detailed how to instructions <a href="http://livelearnlove226.blogspot.com/2010/02/owl-valentines-day-card.html">here</a>. Nothing says, "I love you," better than a Valentine you took the time to craft with your own two hands. 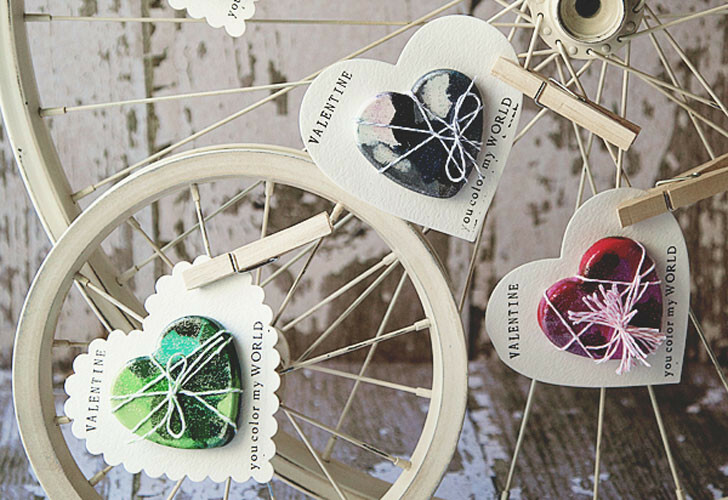 So this Valentine's Day forgo buying cards and go DIY instead. Whether you want to make a sweet and fun Valentine to present to your kiddo, create a sentimental card for your sweetheart, or help your little one design a card to give to a friend or family member, we've found some extra special ideas to spark your imagination. Read on to learn how to make six adorable DIY Valentine's Day cards from paint chip bookmarks to thumbprint hearts.